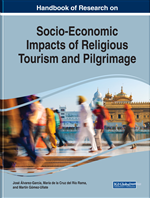 Religious tourism presents itself as an increasing tourism modality despite the growing secularization of society. There are numerous destinations that are including this tourist modality in their product portfolio for the possibilities of economic development that it offers, both destinations considered mature as well as those others that try to position themselves in the tourist map. Within this product, pilgrimages to places of worship or sacred as the most successful by-product are currently being highlighted, with the Camino de Santiago being a clear example of the success of this modality for its enormous recognition, both nationally and internationally. The present chapter focuses on generating knowledge about the profile of the traveler who pilgrims to Santiago through the Via de la Plata Route in the Extremadura territory, focusing on identifying different profiles of pilgrims based on their tourist spending behavior at destination. The exhaustion of the traditional sun and beach model on which most destinations base their tourism development has led to a proliferation of a greater variety of products in the current tourist scenario. Those responsible for planning destinations therefore seem to be in favour of the diversification of their options with new tourist products that will allow them, on the one hand, to overcome the problems traditionally associated with the previous product and, on the other hand, to promote more sustainable tourist development models. The importance, in particular, of those tourist products based on cultural and natural heritage (cultural, rural, nature and also religious tourism) increase in this new context. The relevance of this event lies in the fact that these forms of tourism can play a fundamental role by their ability of being able to contribute to the creation of economic and social progress in rural and less developed areas (Maak, 2009). This is the case of the so-called “inland destinations” that see an opportunity to generate economic and social development in the proliferation of these new products by taking advantage of the rich cultural and natural heritage that they possess. These changes in the market in turn occur and are caused by the behaviour of demand in the current tourist context, that is to say, by a trend towards greater diversification of tourist areas, the search for more select and less standardised products and the dynamism of cultural tourism (Porcal, 2006). In fact, cultural tourism is presented as an attractive product for tourist destinations due to the various opportunities that it offers not only for those destinations that have been in the sector longer, mature destinations, as well as for those others that begin to position themselves in it, emerging destinations. On the other hand, those other so-called emerging destinations, or inland destinations, see the opportunity in the proliferation of products associated with culture and nature that will enable them to position themselves on the tourist map, achieving the economic and social development of their territories, through an exploitation of their resources that allows a sustainable model to be created. Within this new trend in the tourist market should be defined the remarkable importance that religious tourism is having, closely linked to cultural tourism. Although the increasing secularization of society makes us believe that it is a product in decline, statistics show otherwise. In the Spanish case, the Camino de Santiago is presented as the greatest representative of this tourism category, both because of the great number of tourists that visit, or make a pilgrimage, to the city each year, as well as due to its unquestionable international recognition. It should be borne in mind that this French Route to Santiago holds the honour of having become the first to be declared European cultural itinerary back in 1984. As a relatively recently created phenomenon, it has some shortcomings such as the lack of reliable data to allow the sector to be delimited, to characterise it and to show its evolution. In the report produced in 2007, the World Tourism Organisation (WTO) reflected this need as a necessary element in order to formulate appropriate tourism strategies for the efficient development of the sector by local authorities. In view of the foregoing there is a need to create knowledge with regards to this phenomenon that can bring such good results to those so-called inland destinations, which see the possibility of revitalizing their destinations in the development of routes and itineraries by creating economic development. Tourism Expenditure: It includes all the expenses incurred by a person as a result of the realization of a tourist activity, both in origin and in displacement and destination. Pilgrimage: Action carried out by pilgrims on their journeys to places of worship or sacred places moved by faith. Normally they are journeys made walking although other means of travel can be used. Segmentation by Tourist Expenditure: Action consisting of dividing a set of travelers into subsets that are characterized by presenting a similar pattern of expenditure (similarity within groups), and in turn, by having distinctive features with respect to the rest of the resulting group (s) (intergroup heterogeneity). Vía de la Plata Route: This is an old Roman road that crossed the Iberian Peninsula from north to south. It is currently gaining momentum for its rehabilitation and reorientation as a new pilgrimage route. It passes through the Communities of Andalusia, Extremadura, Castilla y León and Galicia. At present, it is one of the existing forms of pilgrimage to Santiago de Compostela from southern Spain. Pilgrim: It is said of the person who makes a displacement to a place considered cult or sacred moved for reasons of faith. Santiago’s Road: This is one of the most popular pilgrimage routes in Europe. It is a series of paths that, starting from different origins, have as their goal the city of Santiago de Compostela, place where the relics and the remains of the Apostle Santiago rest. Religious Tourism: Tourism product characterized by the purpose of the same is the visit to a sacred place or worship.